I’ve systematically analyzed our household diet and concluded: we should probably eat more whole grains and vegetables. Some of us seem to mostly eat raisins and breakfast cereal. Some of us seem to rely frequently on peanut butter sandwiches. And others of us may be developing an unhealthy chocolate habit. Now I am not going to shoulder full blame for this state of affairs, since some of us are very headstrong, some of us fall back on the familiar rather frequently, and some of us deserve chocolate, darnit. But I am trying to work in more whole grains and veggies. Of course, we all have different needs, since one of us is a growing boy, one of us is a tired, hard-working daddy, and one of us is an unfortunately growing mommy who gets to the gym SO infrequently. Also factor in that I don’t feel like standing around chopping while my child tears the house apart, Leo doesn’t like most vegetables, and Aaron gets home minutes before our daily toddler Apocalypse; so something has to give. Today, I cooked with produce (tomatoes and zucchini) that will come into season in oh, three or four months. I made pasta (talk about falling back on the familiar) and I splashed in a little heavy cream, a luxurious ingredient I almost never cook with. The result? 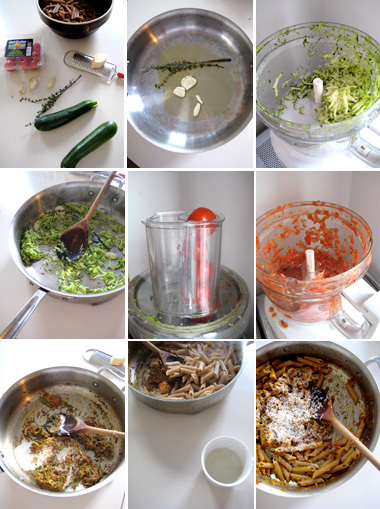 Penne with Zucchini-Tomato Pink Sauce, which the food processor prepared almost without any effort on my part. See, we’re eating our whole grains and veggies! And we loved them. Does your family eat mostly whole grains? Do you manage to stick to seasonal, local produce in Mid-March? Do you cook with cream? 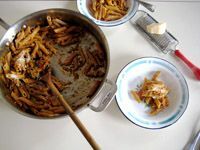 And where do you stand on pasta: perfect everyday fare, or over-used starch?